Despite running a wildly popular Kickstarter, Chris Birch of Modiphius Entertainment still managed to find some time to answer some of the questions we here at Dorkland! 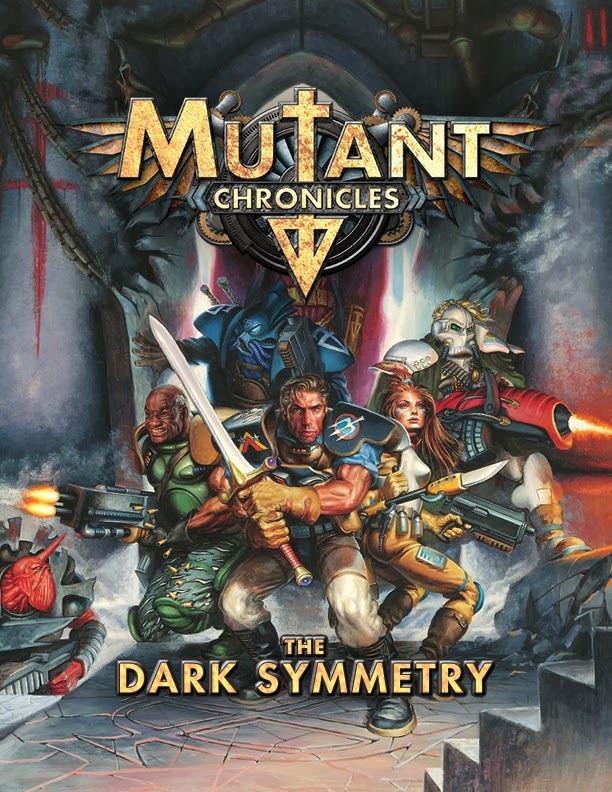 had about Mutant Chronicles 3rd Edition and its Kickstarter. Dorkland! 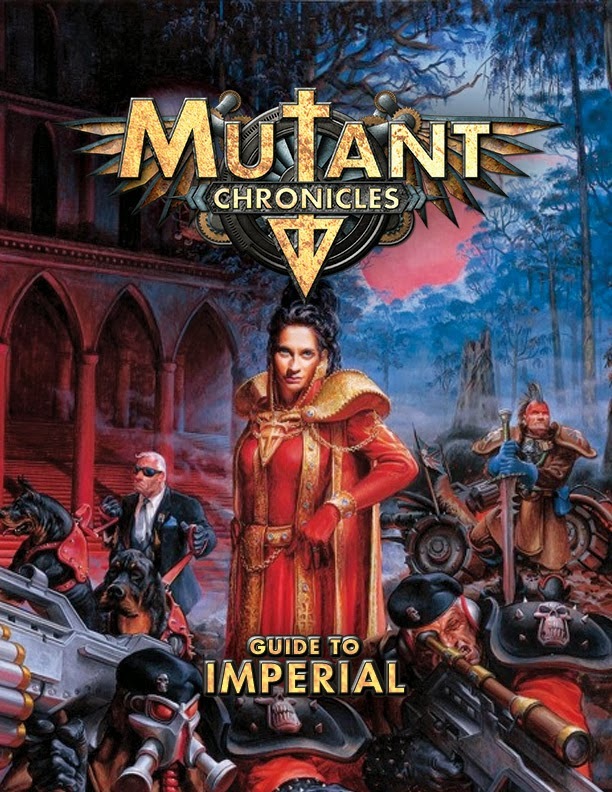 : Have you learned anything new from the Mutant Chronicles Kickstarter and what might that be? Chris Birch: Good question - well I would say that there are so many massive Mutant Chronicles fans who've just been waiting for the return of this awesome game. I keep being surprised every day as more and more join in the Kickstarter - it's like people are coming home! DL: You've run a very successful Kickstarter before and are currently running another very successful one -- what do you feel is your reason for such success? CB: I think it's about the huge amount of ground work we do before we get to the Kickstarter - building up the fan base, talking to them, finding out what people really want, not just what we think they want then using that to steer our cool ideas. 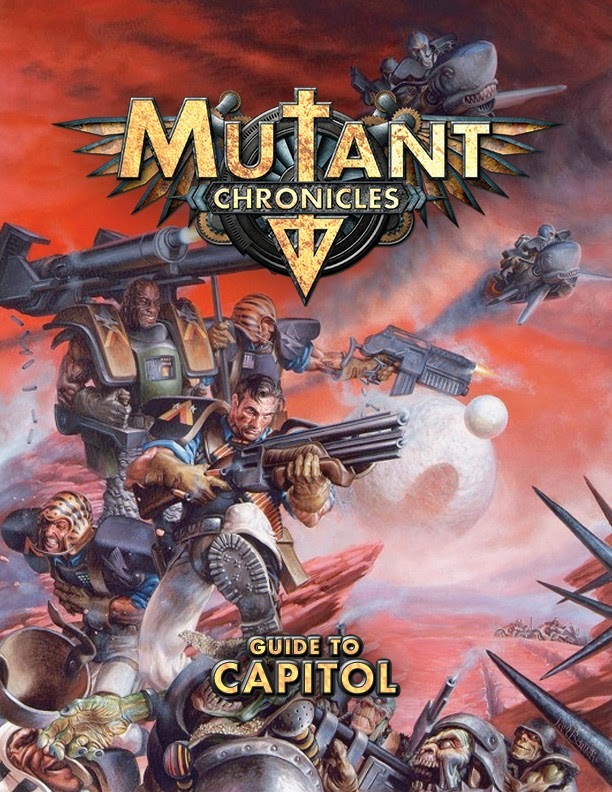 We already knew what we were going to do with the story, but learning what products people wanted to see first, and what aspects of the Mutant Chronicles universe were more important was a huge help in shaping the releases. We had been playtesting with over 400 groups over 6 months so once you get to those kinds of numbers you can have a great start to the Kickstarter. But then it's about keeping up the hard work. You don't just sit back; you are constantly talking to people, responding, giving feedback, creating new graphics, art and sculpts to show off to keep the excitement level high. So many people think they can stick their new idea on Kickstarter with no backup, no research, and no effort day by day - and that's why not every project succeeds. We're often up till 3am working on the Kickstarter, but also the day to day business of Modiphius and it's really hard work - which is why not everyone is willing to do it. I will say though it's such rewarding work - as you see the response of your efforts almost immediately and get to talk to people who are as passionate as us. DL: Mutant Chronicles was created in the 1990's and the old editions show it. Will you be doing any updates to the setting to bring it more in-line with modern technological sensibilities? If so, how? Or, if not, why? CB: The setting was actually very diesel punk although they called it techno-fantasy. The techno-fantasy is still there but we're defining the tech levels before and after the outbreak of the Dark Symmetry - what do the ships look like before the computer systems fail, and what do they end up looking like. We've drawn together all the disparate stories and timelines in to one, worked out the backstory, filled in some of the odd gaps and answered questions left hanging so people are going to discover all of this through the books. The big thing about the setting is it sits nicely in the diesel punk genre that's appeared which is where it's a 1940's/50's era of technology, everything's bigger and chunkier than it needs to be, engines are massive, vehicles huge, shoulder pads bigger! This all works with the 90's era of design they had at the time, and as we develop the looks of the worlds, buildings, ships and more it will all fit nicely with what has gone before as we'll be reusing the classic Paul Bonner art alongside new artists and the point was to bring the rest of the universe to life, not reinvent it for the sake of it. DL: The rules will be undergoing a change, what are some of the changes? Will it still utilize the roll-under method? CB: Yes it's still a d20 roll under, we're making a big announcement about the rules on Monday the 17th of February, so people will know a lot more about the direction we're taking then and we hope to have a revised beta available about a week later (or before the end of the Kickstarter at least) for people to test out. It's being designed to be a really cinematic system though, allowing to you do all the crazy stunts you always imagined you should be able to do in Mutant Chronicles, without the GM suffering under a weight of stats and modifiers etc. DL: One of my favorite parts of the older Mutant Chronicles game was the background cycle during character creation -- what is going to happen to it in the 3rd edition? CB: Yes, the Lifepath character generation was one of my favourite parts too, and we intend to expand on this, bringing a lot more flavoured events in to the process. It will really help you shape a very cool RPG character, but we'll also have a points buy system for those who have a specific concept they want. DL: Why combine the Algeroth and Ilian Guide books into the Dark Soul book? CB: Well, actually what I should say is that the core book will contain a lot more info on all of the Dark Legion Apostles and then the Dark Soul book will expand on this for each of them as well as covering Pluto, Nero, the Dark Legion's history and much more. The idea was to bring together Ilian's and Algeroth's material in from the two books and enhance it with the rest of the Apostles. We also wanted to show how different they each are - so there will be more defined strategies and the creatures properly broken down, so each apostle has different types of heretic and creatures. The creatures and heretics are all described by how they try to attack - what their tactics are. DL: Will all of the original Guide books be given the 3rd edition treatment, even if their stretch goals are not met? What exactly is going to be done with the Guide books? Will they differ from the previous edition? CB: Yes, we're bringing back all the original guides, though the Freelancer supplement is now included in a specific more detailed guide of Luna for example, and yes we'll be publishing all the books regardless of whether they get unlocked through the Kickstarter. They will be re-written, fleshed out with new material, expanded to be major geographic sourcebooks so, for example, Capitol is also the guide to Mars. There will be a lot more insight in to the organisation, gear and resources, character options etc. DL: What is some of the new, expanded content going to be? Are we going to get new Guide books? DL: Three campaigns are planned for 3rd edition -- will these relate to the Venusian Apocalypse adventures in any way? Will anything be done with the Venusian Aplocalypse books? If not, how easy or hard might it be to convert them to the 3rd edition? CB: We plan to convert the Venusian Apocalypse for 3rd Edition and bring it up to date with more artwork, maps and, allegedly, there was an Episode 4. So, I have a feeling that will be really exciting as you'll be able to find out where the storyline was planned to go. There will be a major campaign book (which also reveals some of the secrets) set during the first Dark Legion War starting days after the Pluto landings, leading right up to the final climatic assault on the citadel. The second major campaign book focuses on the 2nd Dark Legion War and is more epic in scale and power. Whilst the third campaign is set during the Dark Eden period (which is still part of the 2nd Dark Legion War) and has a big focus on Earth. DL: Lastly, there are a lot of very interesting facets to the Mutant Chronicles universe -- what are your favorite parts of it? What are the aspects that really get you excited about this game and setting? CB: I think it was the techno-fantasy but with the grounding in the civilisations we know - it's kind of near future, recognisable designs and styling, but the techno-fantasy element lets us do anything. The universe is full of extremes, massive guns, bigger shoulder pads, insane battles and stories. It's the final stand of humanity and I love stories that deal with the epic heroism possible in such extremes. We here at Dorkland! would like to thank Chris Birch for his time and wish him the best with the ongoing Kickstarter. If you would like to know more about giant shoulder pads, Dark Symmetry, and corporate life, be sure to check out the Mutant Chronicles 3rd Edition Kickstarter page or Modiphius Entertainment's website. Dark. That might be the best word to describe Mutant Chronicles. Modiphius Entertainment's Mutant Chronicles 3rd Edition Kickstarter, however, is looking quite bright as it has long since obliterated its initial funding goal and has torn through several stretch goals already. Apart from being some beautiful cover art, it shows off some elements that seem to be pretty key to the setting -- the man in the suit and sunglasses is very corporate, there are military forces (with spikes and skulls -- a must), and some alien-looking backdrops. Looking over the setting material briefly, the world feels like Shadowrun meets Warhammer 40k and that is something I find very attractive. Modiphius is bringing in more than just pretty cover art, though, as they are using this Kickstarter to also re-design the rules and re-write the setting guides (along with adding new content). So, what will it cost you to get in on all this dark-goodness? For more information on Mutant Chronicles 3rd Edition make sure to check out Modiphius Entertainment's website or the Kickstarter page.